Zaydie’s Granola provides their signature cookie recipe below. I checked with them, and yes, you can substitute Smart Balance for the butter. I would imagine that you can also substitute egg whites for the eggs and a higher fiber flour (like organic oat flour) for the white flour if you are trying to reduce cholesterol. 1) Beat butter and sugars until creamy. Add eggs and vanilla. Beat well. 2) Add flour, baking soda, and salt. Mix well. 3) Stir in Zaydie’s Walnut Cranberry Granola. Stir in chocolate chips. Mix well. 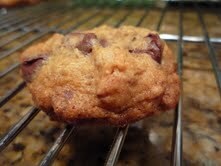 4) Drop by rounded teaspoons onto nonstick cookie sheets. Bake 10-12 minutes or until golden brown. Cool on cookie sheet for 1 minute. Cool on wire rack. Enjoy! “Zaydie's Laydies” can be found at the Market at St. Stephen's every Saturday from 8 to 12. Zaydie's can also be purchased at Ellwood Thompson, Whole Foods Short Pump, Good Foods Grocery, Shield's Market, and Libbie Market, just to name a few. For a more extensive list check their website www.zaydiesgranola.com or their Facebook page.